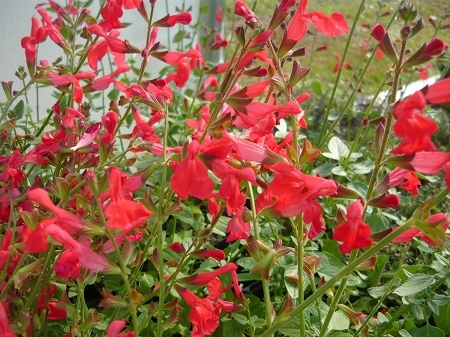 Scarlet Spires Salvia (s. darcyi x microphylla) - Beautiful hybrid salvia features masses of 8" - 12" long spikes of coral colored blooms. Blooms non stop Spring through Fall. Hummingbirds adore it. Easy to grow, not fussy of soil conditions, drought tolerant and deer resistant. High Country Gardens introduction. Perennial zones 7 - 9. Live plant in 3" container. Another must have for my hummer garden. I am in hardiness zone 6a but in mild winters it does survive and return in the following spring.